We've got a page full of hats here for you to print, colour and decorate - a fun activity for Ascot or a wedding, perhaps? We've also got a page full of hat decorations that you can use! Here are some "decorations" to use on our Decorate the hats activity printable. Print them out, colour them in, cut them out and stick them on! Add some design details to this pretty summer sundress before colouring it in. Will it have stripes, or flowers, or dots, or something else entirely? This boy is ready for summer - but perhaps the kids can add some design elements to his Tshirt and shorts before they colour him in? This hat would be great at keeping the sun off your face - but it could be prettier or more striking! Get the kids to add some extra design elements before they colour it in. Here's a colouring page featuring two very fashionable ladies, perhaps modelling at a fashion show? Use your pens or crayons to make their outfits bright and colourful. I would love a fancy pair of flip flops like these! I wonder what colours the kids will choose for the pattern? When it's cold outside a thick pair of gloves is essential - and here's a good pair for the kids to colour in! Get dressed for winter in this woolly hat and scarf! The kids can colour it in any colour combination they like. Here's a simple colouring page of a Scottish kilt, complete with sporran, to print for the kids to colour in. Colour in this snug pair of mittens! Here is a really challenging tracing activity for children - two lovely winter mittens! Once they have carefully traced over all the dotted lines, they miight enjoy colouring them in too. Here's a simple colouring page with three party hats, suitable for younger children for birthdays, New Year and other celebrations. There are three different styles of shoes for the kids to colour in on this fun colouring pages - shoes for all different occasions! These kids are dressed for spring showers, complete with Wellington boots and waterproof coats! This fun colouring page lets you choose the colours for this lovely sun hat - be as bright and bold as you like! Will children colour this top hat colouring page in traditional black or grey or go for brighter colours? Here's a simple outline watch colouring page to print for the kids to colour in. Click the link below for the printable version. Finish off this winter hat by joining the dots 1 to 12 to complete the outline. 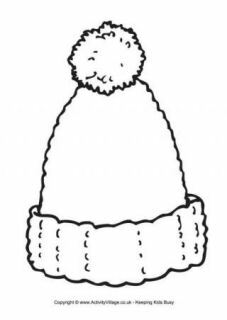 There are double lines in this winter hat tracing page to give the kids lots of practice! Either trace over all of them, or use them as a "channel" and trace between.